Ahhh.... memories of swimming in the Fergus Pool. Fergus pool had the first showers - under the building - in Fergus. You could go and shower for a few cents. You could also swim in the pool from April to November - it was heated from steam/heat from Beatty Factory - the old Fergus Market - now little shops. The heat was piped under the road to the pool. The building was bought and has been re-used. The pools are out.... to be used as a parking lot - but the building is gorgeous. Because of the Titanic - the name Beatty has been in the news. 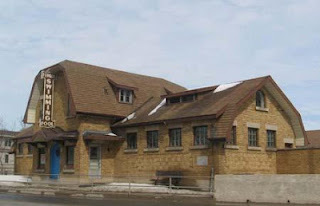 Thomas Beatty - a resident of Fergus was a victim of the Titanic. So, I thought I would show you the pool/land that the Beatty Bros. donated to the Town of Fergus, many years ago. It is now enjoying a facelift as a Car Parts business. The sign has been re-painted and re-hung.... So... very good. Yeah for APC R&R Auto Parts, Fergus, Ontario.